Activate Pandora®, and connect the iPhone® using your dock connector to the USB adapter cable, then press the AUX button. 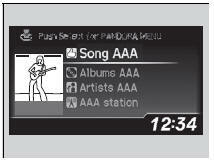 1.Press to display the PANDORA MENU. 2.Rotate to select a menu. 3. Press to display the items on that menu. Pandora® is a personalized Internet radio service that selects music based on an artist, song, or genre a user enters, and streams what is likely to be of interest. To use this service in your vehicle, the Pandora® app must first be installed on your iPhone®. Visit www.pandora.com. for more information. If you cannot operate Pandora® through the audio system, it may be streaming through Bluetooth® Audio. Make sure Pandora® mode on your audio system is selected. Available operating functions vary on software versions. Some functions may not be available on the vehicle's audio system. If there is a problem, you may see an error message on the audio/information screen.